From the personal collection of the internationally famous economist Lord Peter Bauer, a lovely at least 18th/early 19th century (perhaps earlier) framed and glazed textile, possibly of ecclesiastical origins, featuring gold and silver metallic threads and metallic fringe border on a silk velvet ground, professionally and beautifully mounted in a recessed gilt frame with gilt slip, on black ground, in the conservation manner. Lord Bauer was not only a very highly regarded economist and winner of the Milton Friedman Prize for Advancing Liberty, but was also was a renowned and passionate collector of art and antiques. He died in London in May, 2002, at the age of 86. 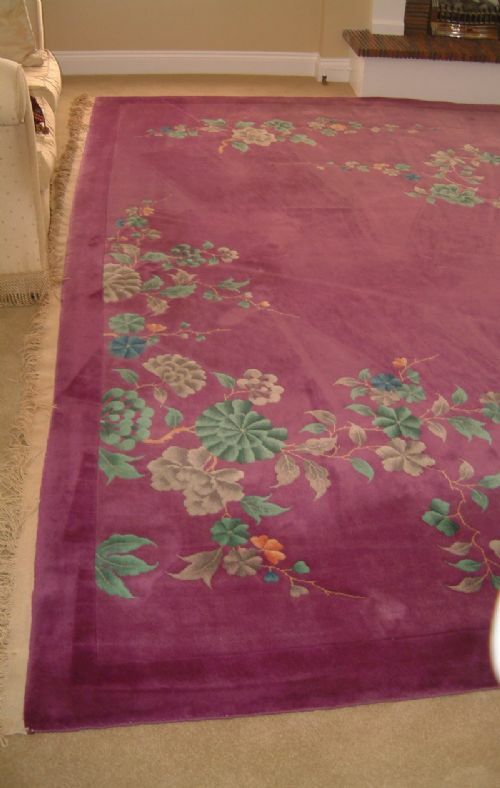 Size-17 inches wide by 32.5 inches long. 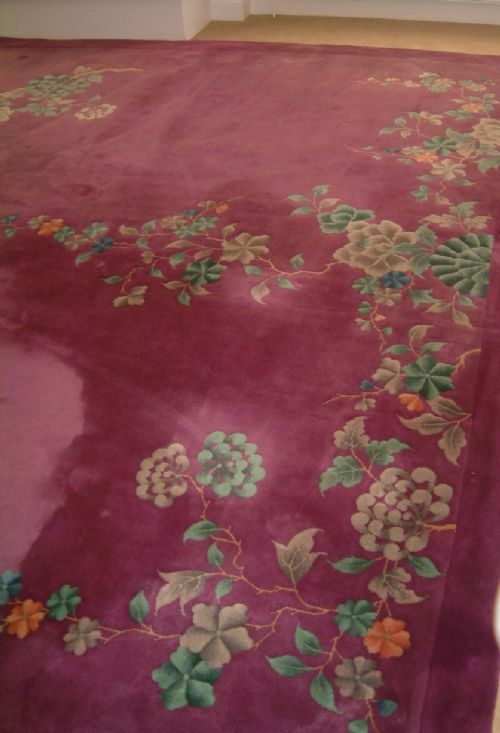 A lovely and decorative piece of substantial size, in very good condition, with minimal wear consistent with its age. This is a chance to own something unique, and with a wonderful provenance. Striking very large Chinese knotted wool rug. 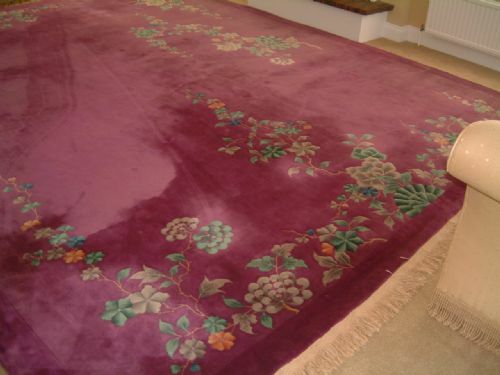 Very large sized 12 feet by 15 feet thick Chinese hand knotted wool rug with elegant asymmetrical foliate and leafy branch detail, and with fringe to both ends. 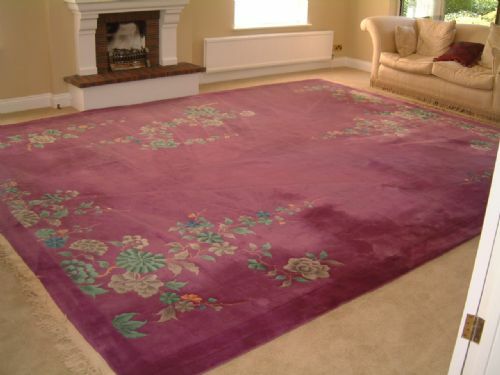 The deep aubergine ground is highlighted with blue, green, grey and rust colours in the detail, which will work with any décor in living room, dining room, bedroom or conservatory. With just the expected signs of wear for its age, it is in very good condition overall. Size-approximately 12 feet wide by 15 feet long. 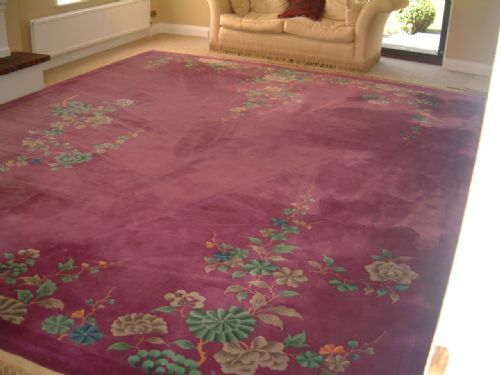 A wonderful and hard to find size rug, with very handsome detail makes this an excellent buy for its quality and size, and a great addition to home or business. 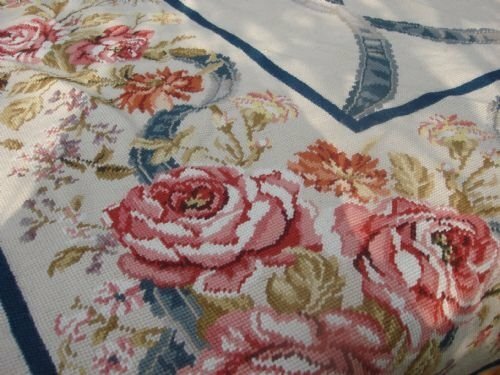 Lovely Aubusson style wool needlepoint rug. 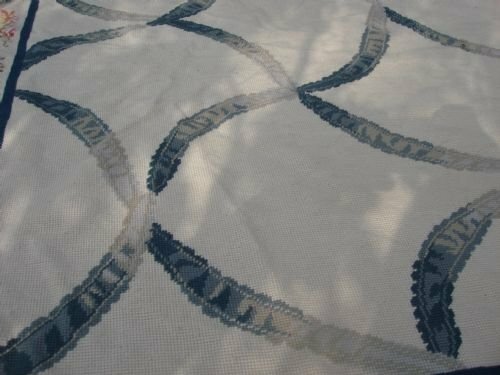 Wonderful quality cream ground Aubusson style wool needlepoint rug with wide foliate border design entwined with twisted ribbon, and twisted ribbon centre. Size-approximately 8 feet by 10 feet. Freshly cleaned, and ready to grace any room. 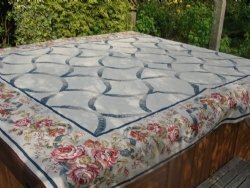 A lovely floor covering, in very good condition, and a great value. 19th century Victorian two piece whitework garment mounted in glazed frame. 19th century Victorian woman's two piece fine whitework skirt and bodice mounted on a white ground in a deep glazed solid oak case, having a champagne gilt slip insert. A lovely skirt and bodice of a fine white fabric, embroidered with a leafy design, and embellished with pearl buttons and handmade lace. The jacket is long sleeved with double rows of lace to the cuffs, and lace inserts to the inner edges of the bodice as well. The skirt has multiple layers of lace detail. 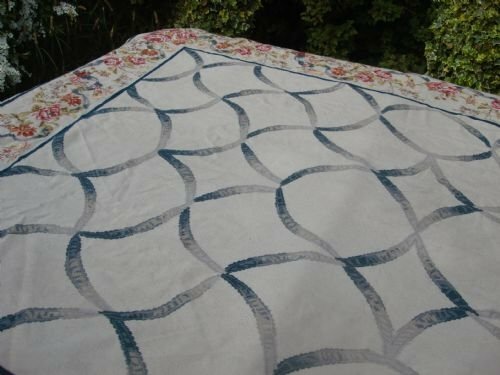 A lovely item for the collector of textiles, as well as a very decorative and interesting large piece to be used as a focal point in any room. Size-39.5 inches high by 30.5 inches wide by 2.75 inches deep. Very unusual and in very good condition.